Cavapoos are a mix between a poodle and a purebred Cavalier King Charles Spaniel. Cavapoos (aka Cavoodles or Cavadoodles) and mini Cavapoos are a mix of a mini Poodle (or toy Poodle) and a purebred Cavalier King Charles Spaniel. Cavapoo puppies are wonderful with children; they seldom meet a stranger and love being with people. They are some of the most calm of all doodle varieties. They seldom bark, and they love to cuddle. Red Cavapoos are our specialty; we primarily breed red Cavapoos. Many of our Cavapoo puppies are various shades of red or apricot. True tricolor Cavapoos are somewhat rare; once a year we use our tricolor phantom mini poodle and tricolor Cavalier King Charles Spaniel to get a litter of gorgeous tricolor Cavapoos. Tricolor Cavapoos are highly desirable; some families think they look a lot like a tiny Tricolor mini Bernedoodle. We also breed blenheim (red/white or apricot/white) Cavapoos. A blenheim Cavapoo is predominantly white with patches of red or apricot. Some people prefer our red/white Cavapoos. These dark red Cavoodles with white trim (white chest, boots, etc.) are gorgeous. 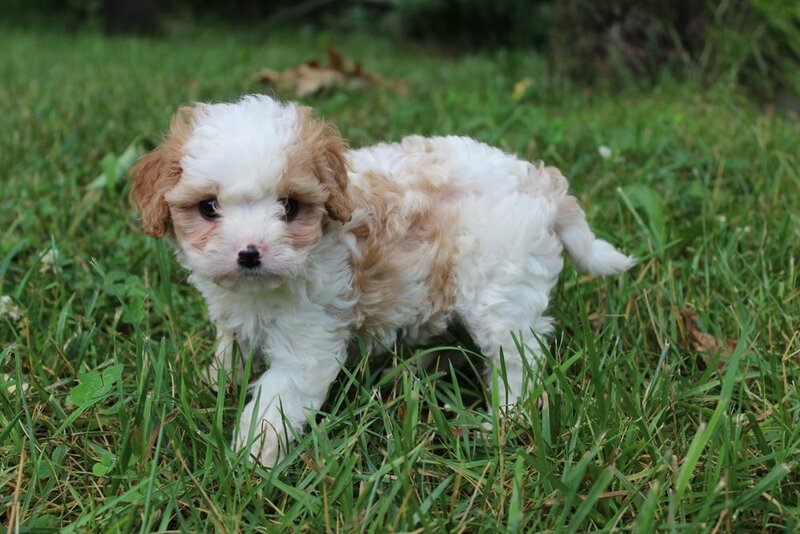 Any other Cavadoodle color pattern than those mentioned above would be a $1400 cavapoo adoption fee. Sometimes we have caramel or cream Cavapoos. Some people like these caramel or cream Cavapoos (or mini Cavapoos) the best. WANT TO FIND OUT MORE ABOUT CAVAPOOS and mini Cavapoos?